As with any business, marketing has its place in its ability to help get the word out. 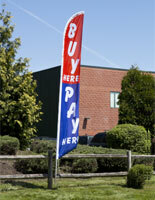 With an outdoor feather flag, a small investment can make a big impression. 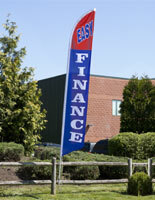 Servicing the tax and financial industries, these flags demand the attention of passersby thanks to their 14 foot height. Even if potential customers don't know your office's location exists, the addition of one of these marketing banners is sure to tell them. They are hard to miss, come in a wide selection of colors, and wave and flutter in the wind. Each stock message design is printed on the fabric with a dye-sublimation process. The flag is one-sided, so one side will read normally while the other side shows a reverse print. 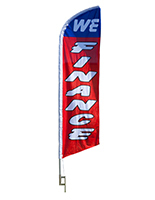 Movement is what attracts the eye, and starting at $50 these advertising flags offer a cost-effective alternative to stay-put, static sidewalk signs. All it takes is one person to set up a flag. Simply thread the banner onto the aluminum rods, push the lawn stake into the ground, and connect the pole to the stake. The wind does the rest! 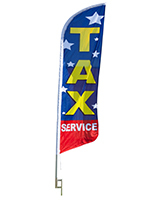 Designed for income tax offices, financial institutions, auto dealers, and retailers, our stock feather flags can't be beat when it comes to getting people inside your door.